In this issue we point the spotlight toward three of Baylor’s professional schools: the School of Law, the Hankamer School of Business and the newly named Diana R. Garland School of Social Work. Each of these equip students for specific career paths, bringing successful practitioners and scholars from the field into Baylor classrooms where they prepare students to practice their vocations in increasingly complex arenas. You’ll meet Dr. Samantha Vo, assistant professor in the Diana R. Garland School of Social Work, who came to Baylor in Fall 2013 with degrees from Dartmouth, the University of Chicago and the University of California at Berkeley. Dr. Vo examines the significant overlap between social behavior and economic realities. Her research agenda emanates from her experience with the social, political and economic strategies employed by cooperatives of rural coffee farmers in Central America. Jim Wren, professor of law, applies marketing research techniques to the practice of litigation, providing future lawyers the analytical tools needed to help them advocate more effectively for their clients. Still representing clients and licensed for federal practice before the U.S. Supreme Court, the Fifth Circuit Court of Appeals, the U.S. Court of Federal Claims and more, Wren provides Baylor law students an informed window into the intricacies of advocacy and cross-examination. Within the Hankamer School of Business, you’ll meet Dr. William Reichenstein, the Pat and Thomas R. Powers Chair in Investment Management. As the world’s economy becomes increasingly uncertain, Reichenstein’s award-winning research delves into issues of immediate concern to a generation of workers approaching retirement: asset and wealth management, taxes, retirement investments, social security and more. 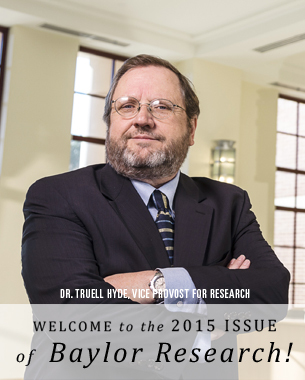 The professional schools are only one aspect of this issue of Baylor Research. You’ll also read about Dr. Thomas Kidd, professor of history, prolific author, and senior fellow in the Institute for Studies of Religion. In addition to being an eminent scholar, Kidd is a favorite with Baylor students, using social media to connect research on 18th century North American religious history to issues in today’s culture. You’ll find his Anxious Bench blog at Patheos.com. Finally, as shown in previous issues, research at Baylor is often the outgrowth of a collision between fields of study. In an increasing number of cases, it is also the outgrowth of collaborations between faculty at Baylor University, the Baylor College of Medicine and Baylor Scott & White Health. Philosophy and medicine come together in the work of Dr. James Marcum, professor of philosophy in the College of Arts and Sciences and former Harvard Medical School faculty member. As director of the Medical Humanities Program, Marcum and his colleagues prepare students for careers in healthcare through a rigorous interdisciplinary program of study. Dr. Bashoo Naziruddin, Director of the cGMP Islet Cell Processing Laboratory at the Baylor Research Institute in Dallas and Dr. Robert Kane of Baylor’s Institute for Biomedical Research are working to increase the survival rate of transplanted pancreatic islet cells ― a procedure offering the hope of a cure for the millions of individuals with type 1 diabetes. Dr. Bin Zhan, director of the Molecular Biology Unit of the Center for Vaccine Development at Texas Children’s Hospital, and Baylor biologist Dr. Choelho Sim, an expert on diseasebearing mosquitoes, are seeking a vaccine to stop the spread of filariasis, a leading cause of death in developing countries. Dr. Yang Li and Dr. Brian Garner, faculty members from the School of Engineering and Computer Science, and Dr. Garrison Benton, an orthopedic surgeon at Baylor Scott & White Health, are developing a wireless biosensor system with the potential to greatly reduce the risk of falls in the elderly. The last of these brings with it an unusual twist: I remember Dr. Benton as a young National Science Foundation Research Experiences for Undergraduates (REU) fellow in the summer of 1999, working in my lab at CASPER. Time flies! And Baylor’s investment in a bright, driven undergraduate has come full circle in Dr. Benton. It’s my sincere hope that what’s conveyed in these words is what I feel every time I walk onto the Baylor campus – walls are coming down, lines of inquiry are intersecting, and the Baylor community of scholars continues to grow. As always, our students – undergraduate, graduate and professional – remain at the center of the dialog. What a great time to be at Baylor!